Good morning friends! I hope you all had a wonderful Mother's Day! 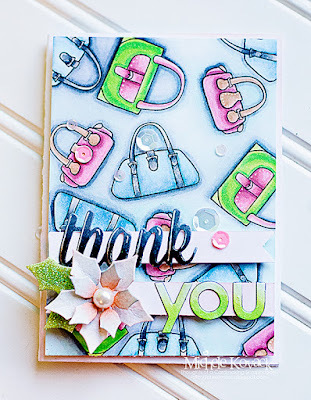 I have a card today that uses these cute purse images. I borrowed this set from a friend when I went to an all day scrap a few months ago. I am pretty sure it was a My Favorite Things stamp, but I am not a hundred percent sure! (So if you know, would you please leave a comment?) When I get stuck creatively (which seems to happen quite often lately), I like taking my smaller stamps and creating a background with them. I colored each of the purses with Copic markers. I added a sentiment and a flower from Spellbinders. I adhered a scattering of sequins to finish the card off. I am in the last few weeks of school! It is hard to believe that another school year is coming to a close already. It's scary how fast time flies! My husband also surprised me with a trip to Vegas this summer! I am probably the only person who has never been to Vegas! We are seeing two shows too while we are there. We are seeing the Beatles Cirque Soleil, and Jennifer Lopez. So needless to say, I am pretty excited! Have you been there? Any recommendations? 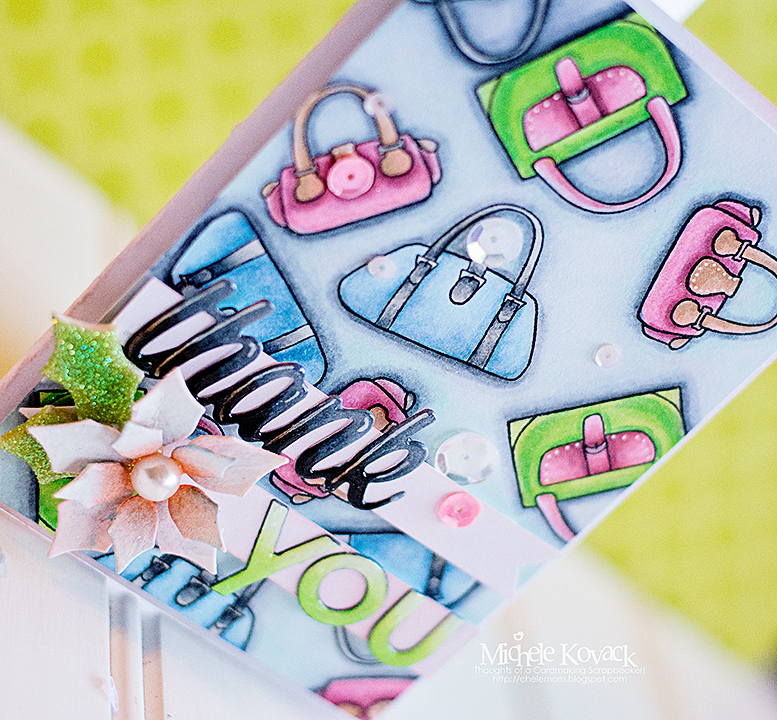 Gorgeous card, love the vibrant colors. Have fun and safe trip. Make sure you go see the EthelM candy factory. The tour is free and the garden area is beautiful. Plus, you get a free sample. Those purses are so cute and they make a great background! Your coloring gives a lot of depth with your vibrant colors. Love it! It's been years since I've been to Vegas so it's changed a lot. I like the idea of the candy factory and gardens. The end of the school year will be nice for you! Love your purse card, but truthfully, I love all of your cards! Enjoy your summer off. I remember those days fondly. There's at least one other person who hasn't been to Vegas, and it's me!! You'll love Vegas!! Fun place. There is a not to be missed ferris wheel at The Linq Resort called the Observation Tower. It is fabulous!! We also saw The Beatles LOVE show!!! It is so amazing. The sound is INCREDIBLE!! I bought the CD of the show's music and it is so good. You might be thinking how can they make the Beatles music any better? LOL! But they remastered the songs and they are amazing. J-Lo should be a good show. We saw Elton John on our last trip there. Awesome show. You're going to have a blast! !